This is a step by step Recipe for preparing Coconut Karanji. The Coconut Karanji or Olya Naralachi Karanji is a famous Maharashtrian delicacy which is prepared during festivals; especially the Diwali festival in Maharashtra. First take the shredded coconut in the frying pan then add sugar and cook till dry. Then add the Dry fruits and Cardamoms powder and mix it well and keep aside. Then take the Suji and add hot Ghee and Salt. Then prepare a Dough and keep aside for 30 minutes. After that grind the Dough in a Grinder for 1 minute. 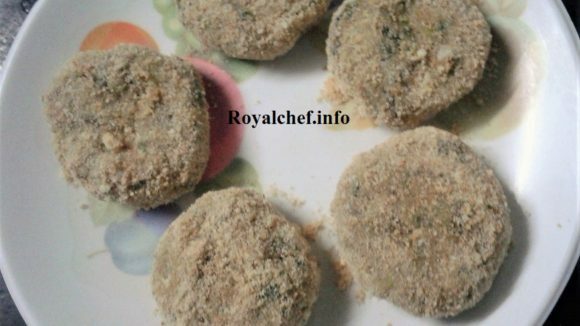 Then prepare small puri fill one table spoon coconut mixture and then fold the puri and press the sides and keep aside in a wet napkin. Heat the Ghee/ Oil in the frying pan and deep fry the Karanjis on a slow sim. Note: When we will put Karanji in to the hot Oil at that time sim will be high after that put on slow sim.